Choux paste is one mighty useful item. It is one of those recipes that can be transformed into so many different things. The French flavor it with savory ingredients and pipe small bits of it into boiling water and call it French Gnocchi. In southwestern US long strips are piped with a star tip into boiling oil then covered with cinnamon sugar and called churros. The French also give it a similar deep-frying but with cheese added to the paste and call them gougeres. The most common of uses is probably baked goods like chocolate eclairs. Here’s a look at several variations on the baked good which may or may not be familiar to you. Profiteroles are the classic sphere-shaped choux puffs that are split in half, filled with ice cream, and topped off with chocolate sauce. These lovely pastries usually pop up in French restaurants and bistros and they’re easily reproduced at home. This example was put together with some leftovers I had in the kitchen: frozen choux puffs, chai tea ice cream, and whole butter ganache from my Bostini Cream pie. I like to keep richer desserts like this on the small side. The full flavor of the ice cream and the rich taste of the ganache can be too much on a restaurant sized dessert. I think everyone is familiar with eclairs. You can find these things at just about any supermarket or bakery if you’re lucky to find one in the states. In my opinion, they are always made wrong: they’re huge, they’re soggy, and they’re too sweet. I find that small, bite-sized eclairs are more satisfying to eat and lend themselves well to a pastry platter. At this small size, it is easy to change up the fillings and icings and experiment. I was a little bit lazy and filled all of these with a praline diplomat cream and just varied the icings to make the display more visually appealing. The name of these pastries will bring a smile to your twelve year old brain: Paris-Brest. No, not that breast! These pastries were created in honor of the Paris-to-Brest-to-Paris bike race that started over one-hundred years ago. They are supposed to represent either a bicycle wheel or the round trip ride, either way, they’re good. 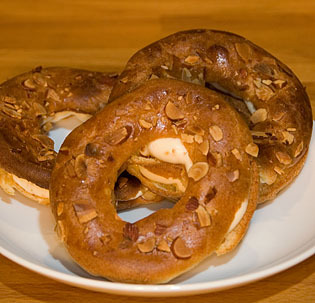 They are classically topped with sliced almonds and filled with an almond praline pastry cream. Sometimes they are dusted with powdered sugar, sometimes they aren’t. 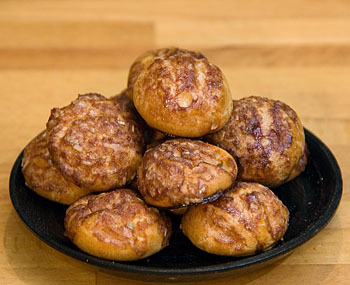 I recently learned about these little pastries called Chouquettes from an old post on David Lebovitz’s site. These little snacks are small bites of choux paste that are usually covered with very course, crackly sugar and left unfilled. While I couldn’t fine any of that stuff around these parts, I did have some large-grained Maui sugar that worked quite well. These things are borderline addictive, yet so simple you can’t imagine why they’d be so good. 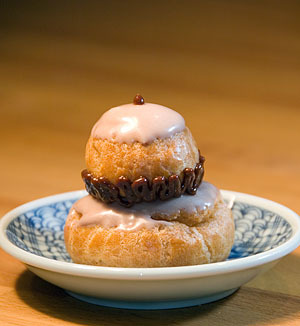 Imagine a light and crispy cookie with just a crunchy sweetness on top, that’s a chouquette! The final choux I created was the Religeuse. These are supposed to resemble a little nun but I’m not entirely convinced. This pastry is comprised of one large choux puff and one small choux puff, filled with pastry cream, dipped in poured fondant, stacked up, and decorated with icing. These are usually medium sized pastries about the size of your palm. Laduree, the famous macron people, are also somewhat famous for their Religeuse. They ice and fill their pastries with exotic ingredients like rose, tomato, and black truffle. 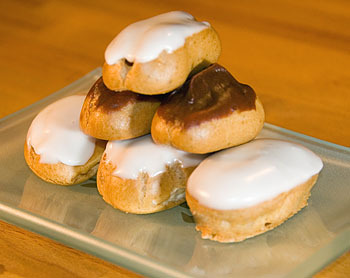 I wasn’t so daring and used a mocha faux-fondant and the praline diplomat cream from the eclairs. In the end, choux recipes don’t really vary all that much. I really liked this recipe from Michel Roux’s Finest Desserts because the proportions were easy to remember and the choux came out nice and smooth. If you desire, you can either use all milk, all water, or both like I used here. I don’t really see much of a difference in the end product but I haven’t thoroughly tested the variations. You can use this recipe for all of the creations I’ve listed above. 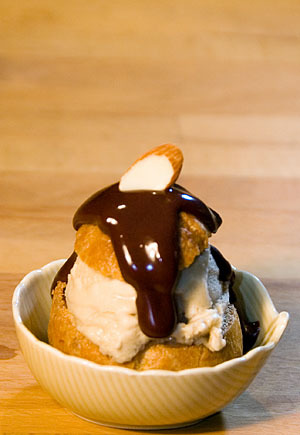 Profiteroles, chouquettes, and religeuse are all made with small balls of dough either piped or made with a spoon. Eclairs and the Paris Brest should be piped out to the desired shape. All of these pastries will benefit from a light eggwash before cooking and a slight flattening with the back of a fork to promote even puffing in the oven. Combine the water, milk, butter, salt, and sugar in a saucepan and boil over high heat. Continue boiling until all of the butter is completely melted. Remove pan from heat and quickly dump all of the flour into the liquid. 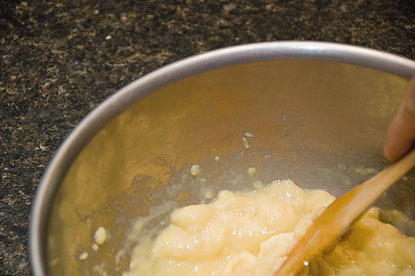 Stir continuously until a smooth paste is formed. Return the pan to the heat and stir the paste with a spatula for one minute. Try not to let the paste dry out too much or it may crack during baking which will affect the presentation of your choux puffs. Transfer the paste to a bowl and immediately use a spatula to beat the eggs in one by one. Beat the paste until it is very smooth. The choux paste is now ready to use. If you are not going to use it right away, press plastic wrap on top of the paste and refrigerate for up to three days. If you are cooking your choux immediately, pipe into the desired shape on a parchment or silpat lined baking sheets and bake at 425F for 8 minutes then lower the oven to 375F for about 15 minutes more or until the choux are golden brown and mostly dried out. You may have to sacrifice one to test for doneness, but it is worth it. Veron: funny, I’ve never made savory choux before, maybe someday. Amrita/Brilynn: give it a shot. I think the recipe is straight forward so when you get the courage, have a go. I’m free if you have questions. It looks like you had much more success than I did with choux pastry, I’ll definitely give yours a try when I work up the courage to make it again! I’ve only used choux pastry in gougeres and cream puffs. Nice to see its other delicious applications. Super Excellent Wow, Master Chef! Brest Brest Brest.